Sitting on a quiet street not far from the heart of Canterbury, Kent sits a charming 2-story English cottage known locally as the Cat Haven. This quaint little cottage is the purrrr-fect sanctuary for the strays of the commons. There are stairs to play on, lattice to climb and flowers to smell and best of all a marvelous thatched roof to sharpen their little claws on.......The cottage has 4 rooms, an attic, 2 hallways, and a greenhouse. The kit comes with the thatched roof, scribed wood floors, 3 interior doors, 2 exterior doors and the greenhouse door as well as all three windows. 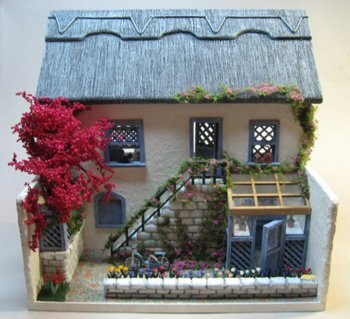 The steps, handrails, rock walls, cobblestone walkways, patio and all lattice also come with the kit. It even comes with the bicycle kit which is laser cut from wood. All wood and Gatorboard house parts are laser cut. Landscaping and all interior furnishing & furniture including the cats DO NOT come with the kit. They may be purchased separately. Students will learn how to paint resin, plastic and stucco walls. All wood pieces are laser cut.